Hillary Clinton woke up Friday to bad news: the U.S. economy is slowing. Just about everyone says the key to her victory in November is a strong economy. She's campaigning on the fact that President Obama dug America out of the worst downturn since the Great Recession, but she's the one to finish the job and ensure everyone benefits. It just got harder to make that case. The U.S. economy only grew 1% in the first half of 2016. That's not a contraction, but it's well below the 2.4% growth from last year, let alone the historic average of over 3%. "Today's numbers are a disappointment," wrote Brian Coulton, chief economist at Fitch Ratings. "Growth is clearly not going to reach 2% this year." Donald Trump has yet to mention the lackluster growth, but he's already trying to cast Clinton as someone living in a "fantasy universe." He could easily hammer the fact that a lot of the weak growth is because businesses are not investing. That shows a lack of confidence. Fair or not, Clinton's campaign is tied to the Obama economy. Until recently, the overall economic picture was looking pretty good (think: B+). Millions of jobs have been created in recent years. Americans are getting back to work. They are even starting to get much needed boosts to their pay. On top of that, gas is cheap. All of this points to a Clinton victory, says Moody's Analytics, which has correctly predicted the winner of each presidential election since 1980. They have been calling the race for Clinton for months because of the economy. But her margin of victory over Trump narrowed this summer in Moody's model. And that was before the latest report on sluggish growth. Moody's says it's too early to tell if this latest news will make the Clinton v. Trump race a tie (sometimes there are dramatic revisions to growth numbers, so it's possible it won't look so bad in a few weeks). But it could. "If the slower growth becomes reflected in President Obama's approval rating over the next few weeks, it could definitely create a problem for Clinton as well," says Dan White, senior economist at Moody's Analytics. This latest twist for Clinton comes at a time when she's already trying to fight off concerns over her stance on trade deals. Trump has taken a hard line on wanting to renegotiate just about all of America's trade policies. Clinton once supported the so-called Trans-Pacific Partnership -- TPP -- but now she's against it. Numerous Democratic convention delegates held up signs saying "No TPP" this week in Philadelphia. It's one of the reasons Democrats are worried about union voters swinging to Trump. 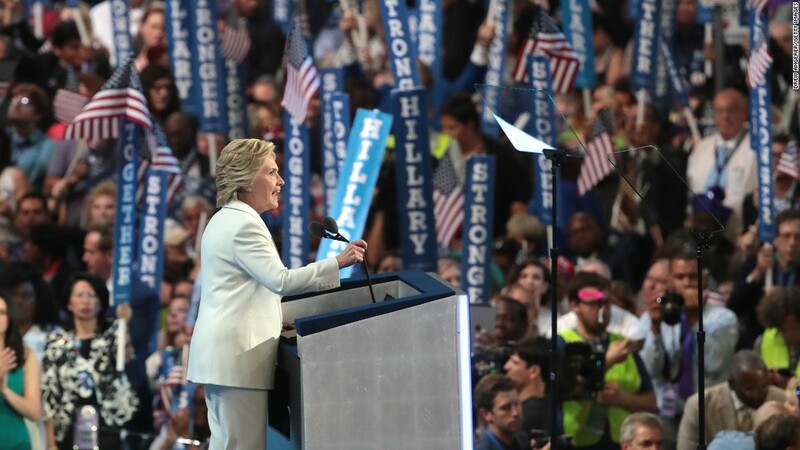 Clinton made a strong effort in her big convention speech to show she gets the frustration that the middle class feels about being left out of the economic recovery -- and that she'll do a lot more than Trump to make life better. "I believe that our economy isn't working the way it should, because our democracy isn't working the way it should," she said.